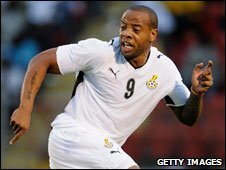 A knee injury means that Junior Agogo will not be available for Ghana at June's World Cup in South Africa. The 30-year-old striker, who plays for Apollon Limassol in Cyprus, has undergone surgery on his knee that rules him out of action for six months. He missed Africa Cup of Nations in Angola when Ghana coach Milovan Rajevac said he was not fit enough. However, Rajevac added that he would consider Agogo for South Africa if his fitness and form improved. The former Bristol Rovers and Nottingham Forest front man starred for the Black Stars at the Nations Cup on home soil in 2008 scoring three goals, including the quarter-final winner against Nigeria, as they finished third at the tournament. Since then he has struggled with injuries and had a long running dispute with his former club, Egyptian outfit Zamalek.